I took a chance on this book, as I'm normally a fan of historical fiction or biographies. But I was intrigued after reading the summary on the jacket. First of all, yes, it's a novel. But, based on 'facts'! I couldn't resist. 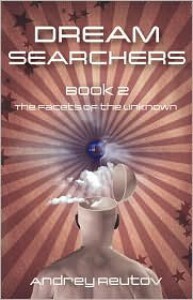 I bought the book, and before reading, had to dissect the author's note and epilogue, but did some researching online about this group the "Dream Searchers" first. This book immediately took off, and kept running. It was thrilling, and at times I even exclaimed aloud when different turn of events surfaced for the book's protagonist, Maxim. Though it didn't take long to read, I found myself gorging every few days, reading late in to the night, and then taking a break for a few days. On the evening that I finished the book, I was so wound up with thought that I couldn't sleep (managing only an hour of sleep before work). I wouldn't do it any differently. This book is about lucid dreamers, and nighttime reading just seemed to make sense. One thing to note, is that the author disclaims that this is a work of science fiction. Not usually my thing - but in this case, there is so much to research about lucid dreaming, and there's even a moral of the story!--choosing between what's honourable that may take hard work, and living a taxing, yet gratifying life, or taking the high road and live beautifully -- with severe social consequences. If you've seen the film "The Matrix" there are a lot of similarities. The blue pill/red pill type of decison-making. Though just a book, I couldn't get it out of my mind. Never before has a novel had me researching online so much about the topic at hand, and in this case it is lucid dreaming. It also influenced me to start tracking my own dream behaviour, and encouraged me to learn (or in my case 're-learn') how to have a lucid dream. All the while, I was caught up in such action with Maxim's thrilling ride to overcome a group of political, bureaucratic authority who tries to take down Maxim and his team of Dream Searchers who pose as a threat to their power.